Progress on impaired driving has stalled since the mid-1990s. Despite earlier declines in alcohol-related highway deaths, about a third of all drivers who die in crashes in the U.S. have blood alcohol concentrations of 0.08 percent or higher. More than 7,000 deaths could have been prevented in 2012 if all drivers were below the legal limit. The key to reducing alcohol-impaired driving is deterrence. People are less likely to drink and drive if they believe they'll get caught. Sustained and well-publicized enforcement is the best way to let potential violators know they won't get away with it. administrative license suspension. This procedure, allowed in most states, lets police immediately take away the license of someone who either fails or refuses to be tested for alcohol even before they are convicted. sobriety checkpoints. Checkpoints, which have been upheld by the U.S. Supreme Court, don't always result in a lot of arrests, but they are a good deterrent if they are visible and publicized. Not all states have them. minimum drinking age of 21. Young drivers have a much higher crash risk after drinking alcohol than adults. 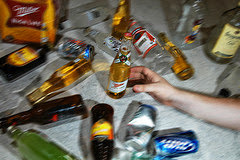 Setting 21 as the minimum legal age for purchasing alcohol has helped reduce alcohol-impaired driving among teenagers. However, better enforcement of these laws is needed in many places. alcohol interlocks. Many states require these devices for people with impaired driving convictions. People are less likely to reoffend when they're required to have an interlock.